Reef romance is a natural outgrowth of Sea-Monkeys meeting in this enchanted castle. The lid of this water-world style aquarium is a magnifier, allowing close-up views of the creatures as they glide through the castle. Comes with 4 packets: #1 Water Purifier, #2 Instant Live Eggs, #3 Growth Food, #4 Plasma III, illustrated instructions, feeding spoon, and an Aqua-Leash. 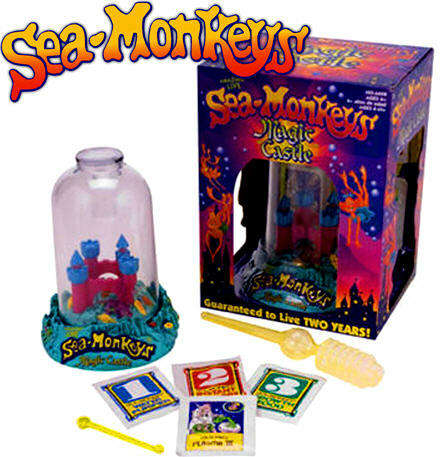 Instant Life Sea Monkeys come to life before your eyes!